Less than a week left until Christmas! Can you believe it? I love bundt cakes – they are so pretty and so easy to make, plus they make perfect gifts. 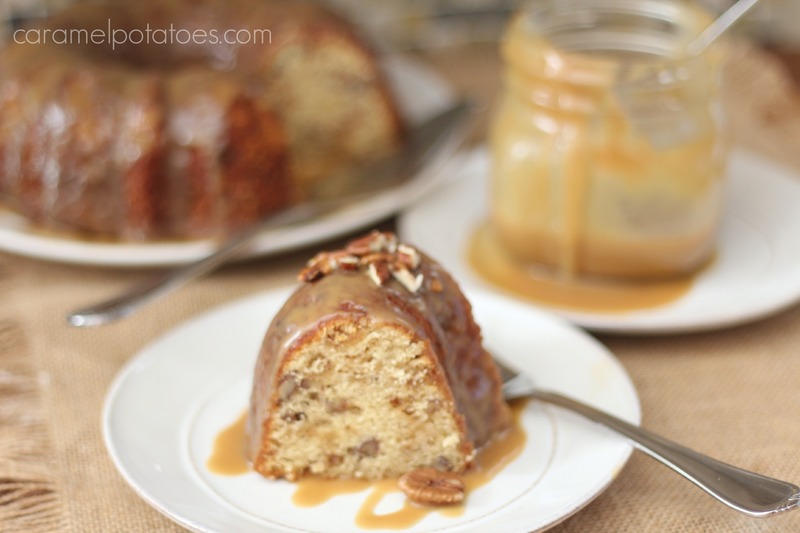 This Caramel Toffee Pecan Bundt is another amazing cake! It is loaded with brown sugar, toffee chips, and pecans . . . mmmm sounds good, right? 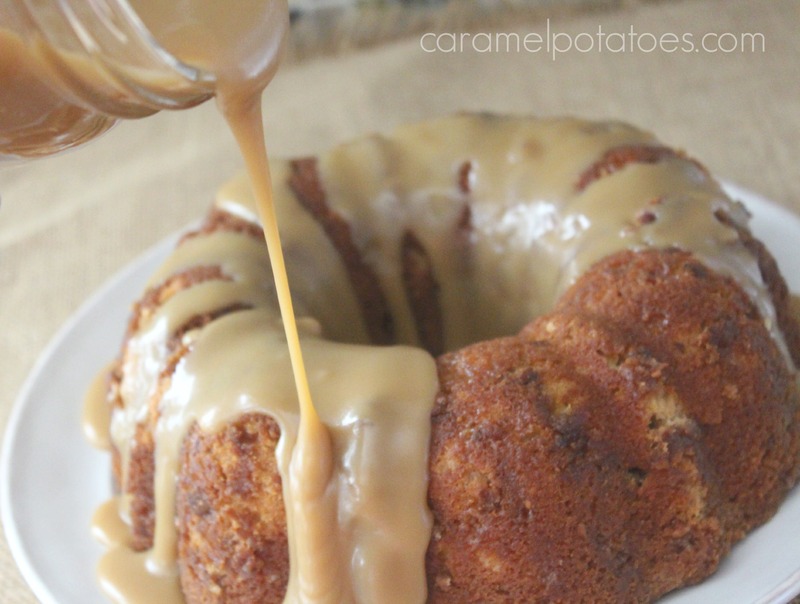 If that’s not enough – all that goodness is topped off with a caramel sauce to take it completely over the top! You’ll love serving this cake for the holidays or giving it as a gift with our Christmas Bundt Tag! Preheat oven to 325 degrees and generously spray all surfaces of a 12 cup nonstick bundt pan with nonstick cooking spray WITH FLOUR, OR grease and flour the inside. Set aside. Beat the butter until creamy then add sugars, beating until fluffy. Add eggs, one at a time, beating until just the yellow disappears after each egg. In a medium bowl, combine flour, baking powder, and salt. Gradually add flour mixture to butter mixture in thirds, alternately with milk in between each third. Beat until just combined. Stir in toffee bits and pecans then spoon batter into prepared pan. Bake until a wood pick inserted near the center of cake comes out clean, 85 – 90 minutes. You may need to cover the top of the cake with foil near the end of cooking time to prevent excess browning. Let cake cool in pan for 10 minutes. Remove from pan, and let cool completely on a wire rack. Spoon caramel over cake and devour. Add butter, brown sugar, water, and salt to medium saucepan and heat over medium heat, stirring until butter melts. Bring to boil for 5 minutes (it will bubble a lot! ), stirring occasionally. Remove from heat and stir in 1/2 cup evaporated milk and vanilla. Add additional evaporated milk to reach desired consistency. Store in the refrigerator in an airtight container for 5-7 days. This caramel reheats beautifully in the microwave or stovetop. 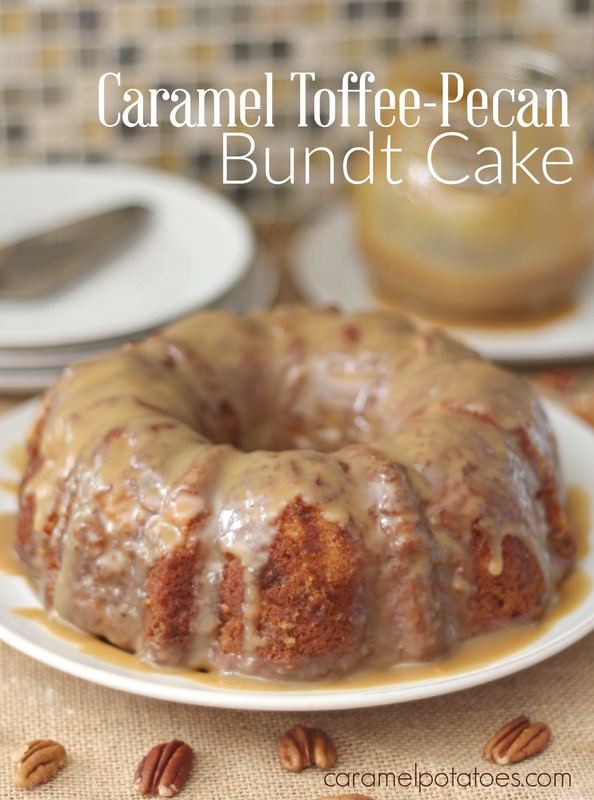 Follow caramel’s board Bundt Cake on Pinterest. I love your bundt cakes, full of flavor and quick to make.